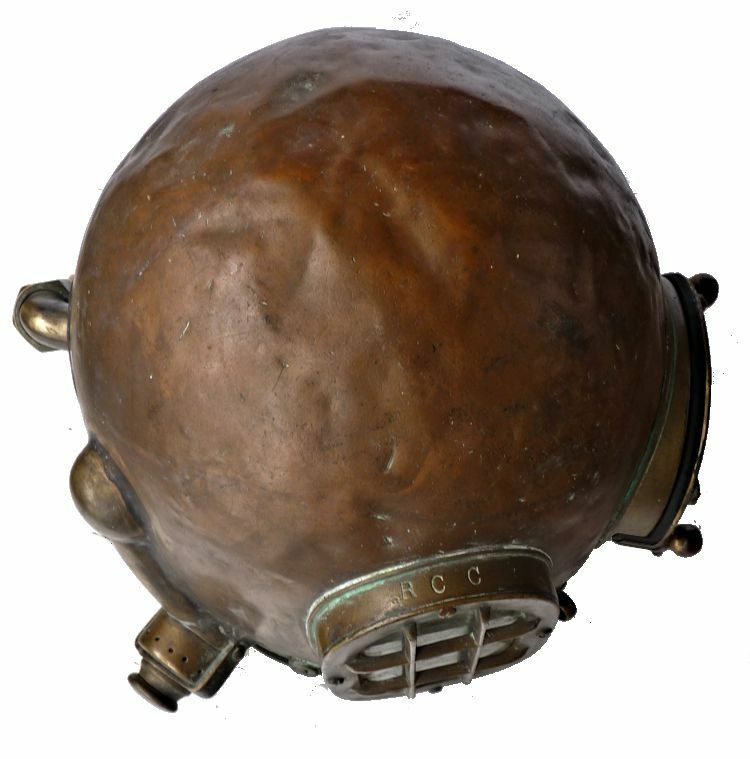 To view our current inventory of fine vintage diving helmets, click here! 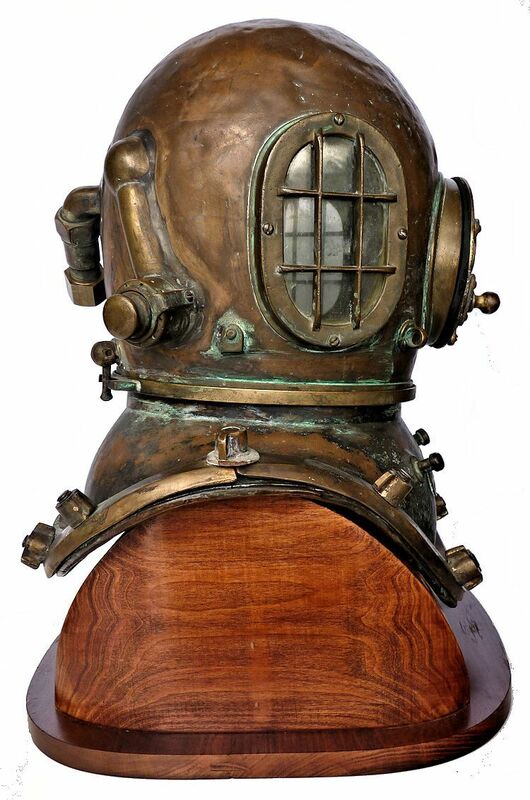 DIVING HELMET Ca 1900 -1920! 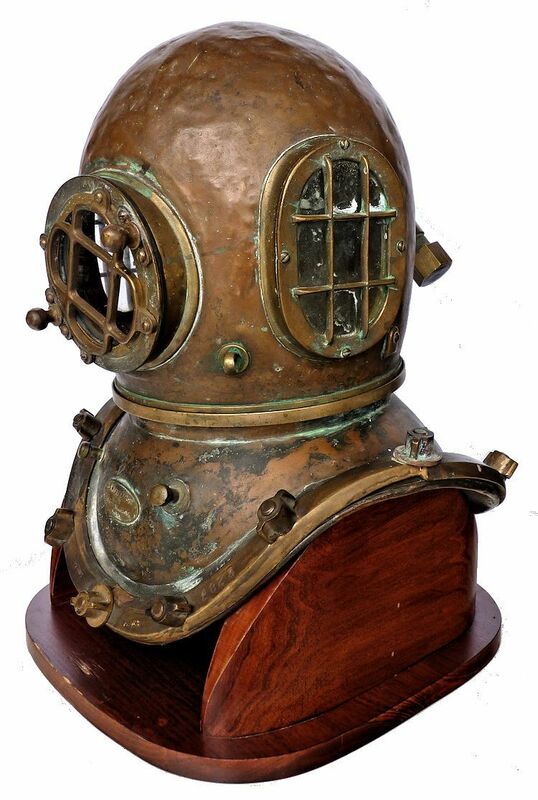 Presented is an interesting 3 light commercial diving helmet made by A. J. Morse & Sons, Inc., and carrying serial number 2823 on the breast plate neck ring and the brails and serial number 1536 on the bonnet's neck ring. This dates the bonnet to the late 1800's or the very early 1900's. The breast plate is from Ca 1919-1920. The chocolate brown patina varies from medium to dark brown with tinges of black, making an interesting contrast of colors. There are numerous small dents all over the bonnet that have accumulated over the 100 year age. These early style commercial bonnets are recognizable by their erect standing rectangular sidelights. 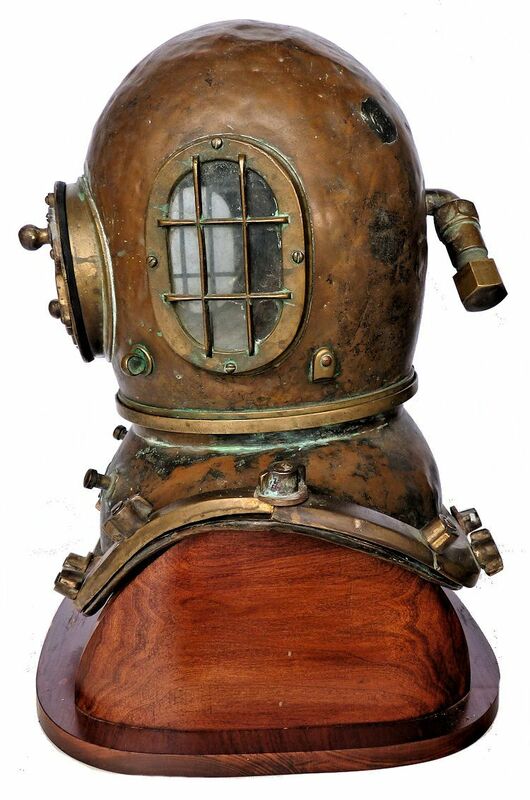 This model helmet appears in the 1910 Morse catalog on page 35, but was known to be around around years before. The stand is not included or for sale. CONDITION: The front door unscrews and the early style exhaust valve wheel turns. The air passages are all intact. The chin button is in place and functions. Field repairs were made to stop leaking, and there are two quarter size seals on the bonnet's back. These may have been for communication inlets. The air inlet elbow looks to need repair. The brails, are original to the breast plate and all marked the same. The bonnet shows numerous small dents in the front and on top. All the port looks to be original. No communication is fitted. MARKINGS: The Morse name tag reads A.J. Morse & Son, Inc., Boston, Mass., USA, on four lines. The number 2823 appears on the lower neck ring and on the top of all four brails. The two front brails are stamped "front". The bonnet's neck ring is stamped 1536. 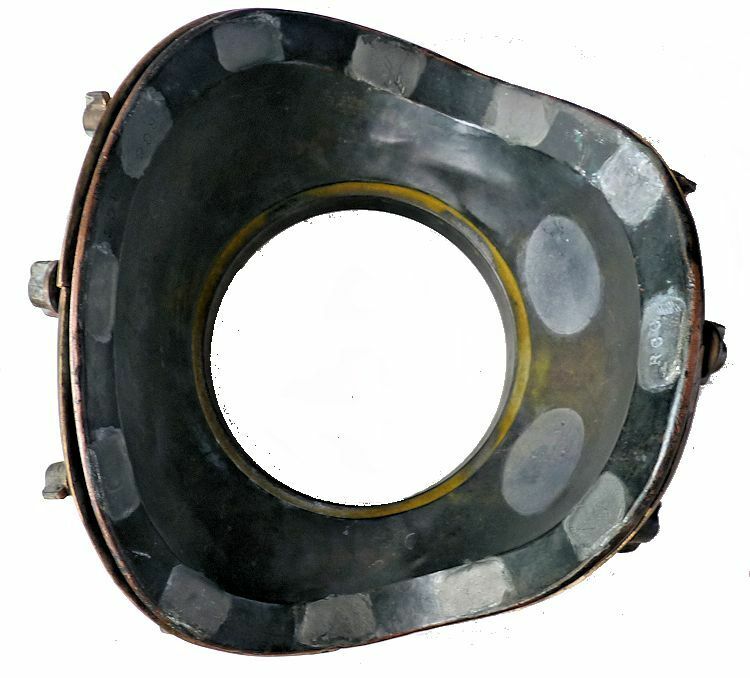 The initials "RCC" are stamped on the top of the side port frames and under the bottom of the breast plate in two places. The RCC are on the underside of the breast plate, top. Inside of bonnet showing the vents, bottom. 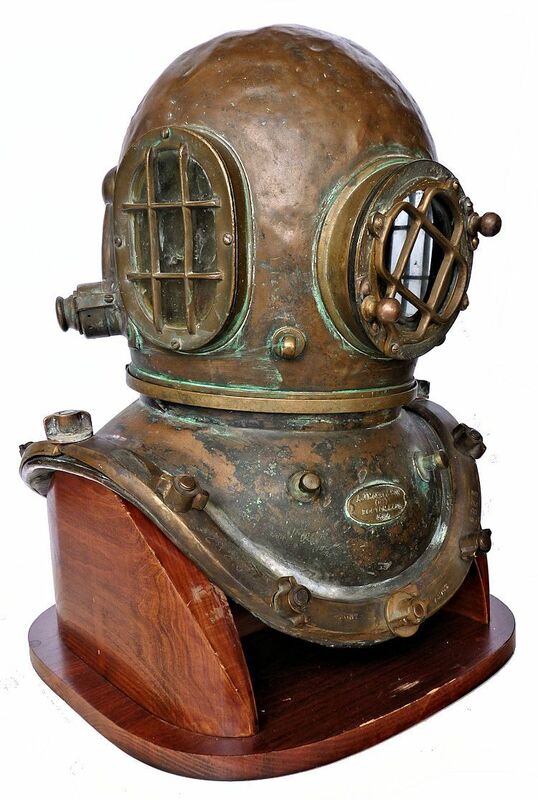 HISTORY OF MORSE DIVING: In the arena of deep sea diving, there are few companies with the longevity and history of Morse Diving. 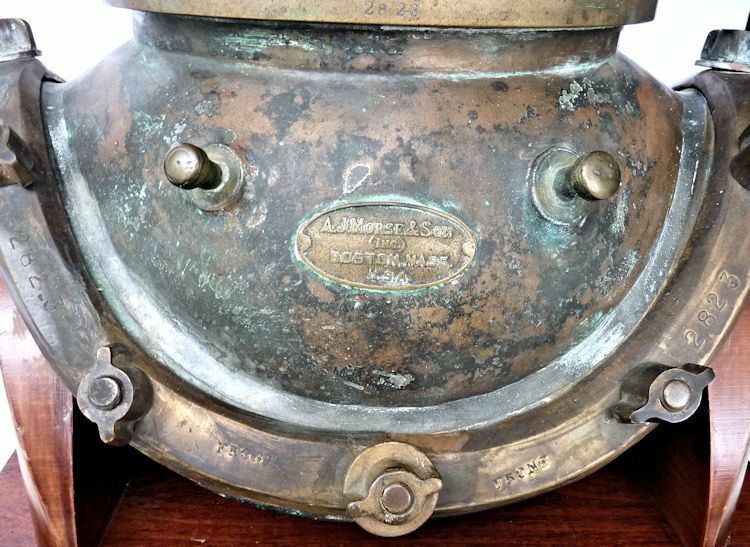 The company was founded in 1837 as a Boston maker of brass ware, three years before Englishman Augustus Siebe manufactured its first closed air dive helmet. 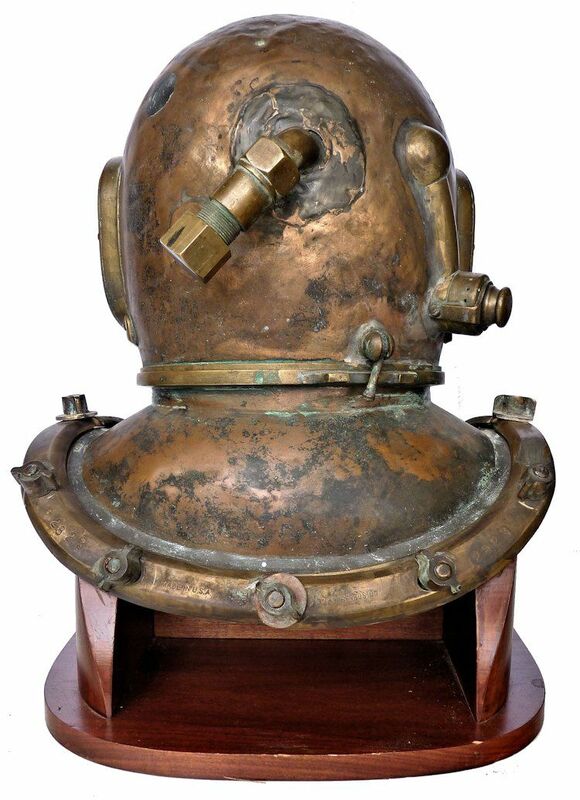 During the Civil War, the firm commenced building maritime fittings and began experimenting with early underwater hard hat designs from Siebe-Gorman and other pioneering makers. 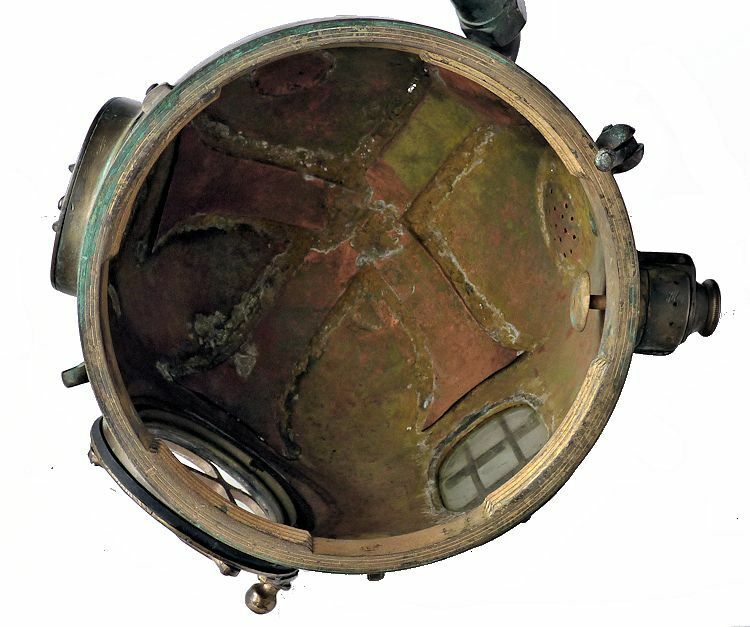 In 1864, Andrew Morse bought out his partner, introduced his sons into the business, and began to focus on creating new products for underwater salvage expeditions. In 1904, that firm became A. J. Morse and Sons, Inc., under which name it continued until 1940. 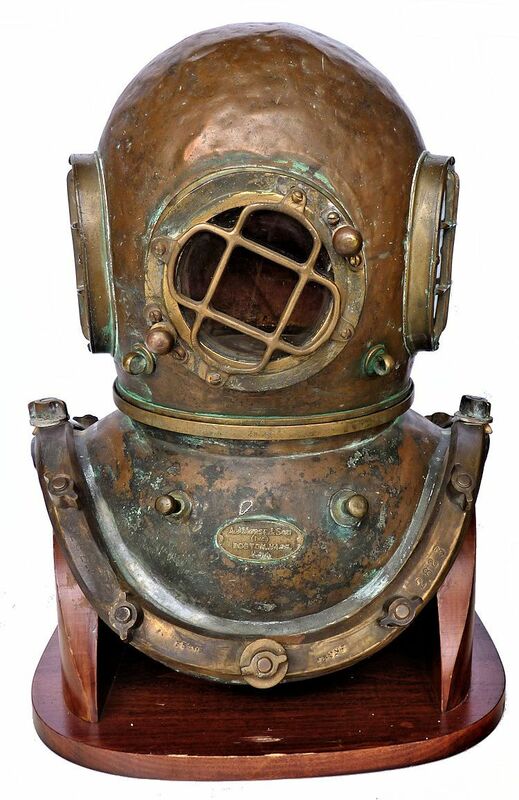 Then the name Morse was reincorporated as Morse Diving Equipment Company, Inc. Then in 1998, the company changed owners, and became Morse Diving Inc. under the leadership of Ken & Donna Downing where it continued to serve the needs of the Diving Community until 2015 when Morse operations were terminated and much of its assets were transferred to DESCO Corp. of Milwaukee WI. SHIPPING; This is a heavy article and it will be shipped by FedEx Ground Point to Point. Please inquire as to rates by email and include your zip code. Shipping for a helmet in the U.S. within the 48 states is $175.00.